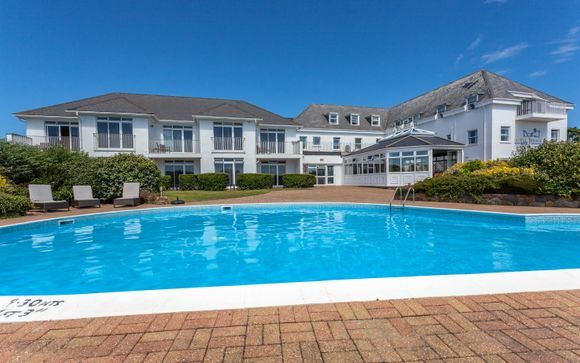 Experience the best of Guernsey with a stay at the beautiful Hotel Jerbourg, complete with an outdoor swimming pool. Stay five nights or more between 19th April and 19th September and receive a free trip to the picturesque island of Sark. Explore this spectacular island in style with complimentary car hire for the duration of your trip! 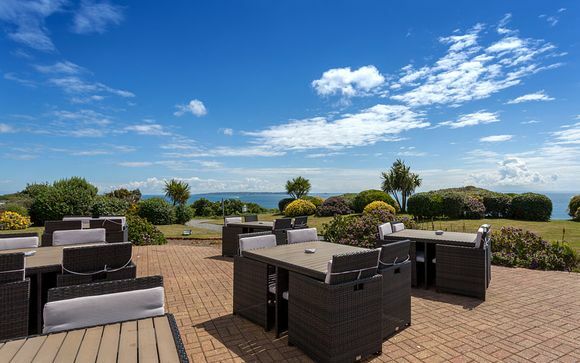 Stay at the Hotel Jerbourg, nestled within a peaceful area on the island of Guernsey. 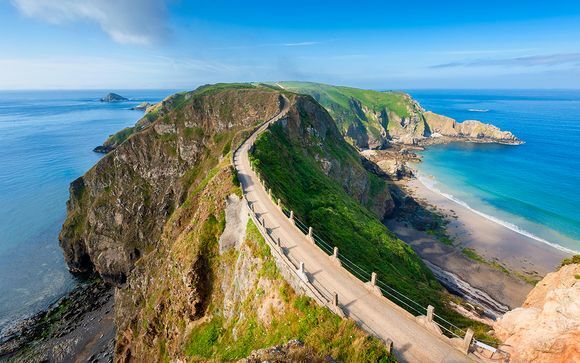 Guernsey is a captivating island located in the English Channel. Offering sandy beaches and fantastic trekking opportunities, this destination suits those who like to venture into the great outdoors. This hotel is situated just a short car journey away from St. Peter Port, the island’s thriving capital filled with museums, historic monuments, boutique shops, and a charming harbour. To learn all about the island’s history, be sure to visit the 800-year-old Castle Cornet, comprising four gardens, five museums, and a live history performance. Within the port, visitors can wine and dine at one of the town’s many gourmet restaurants, or, take to the water on a boat trip. Test your balancing skills with some paddle boarding or climb down to the secluded beach at Petit Port. 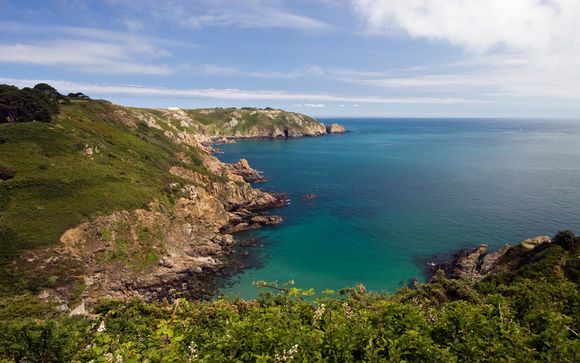 And, if you have enough time, take a ferry across to the idyllic car-free island of Sark, the perfect location for a romantic evening of stargazing. The Hotel Jerbourg is a gorgeous place to stay, situated in the Guernsey countryside. 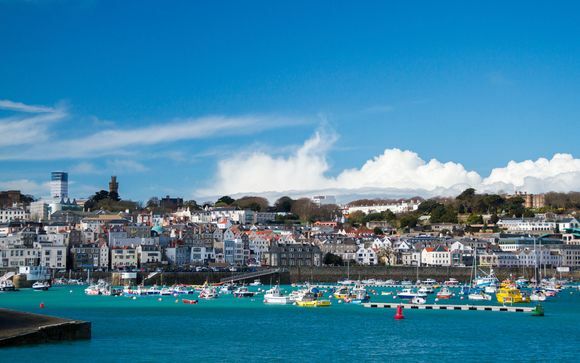 This hotel offers peace and quiet, just a 15-minute drive to St Peter Port. Surrounded by incredible hiking trails, guests at this hotel can enjoy the remarkable walk to the Fermain and Jerbourg Cliffs via La Bouvee Farm. Other nearby attractions include Fermain Bay, Marble Bay, and St Martins Village. Open between March and December, guests can enjoy the onsite restaurant, bar, Cliff Top Coffee Shop, and Dessert Bar with its huge selection of sweet treats. The Hotel Jerbourg also features an outdoor swimming pool, sun terrace, and garden, for a truly relaxing experience. Bright and spacious, each room at the Hotel Jerbourg is designed with comfort in mind. 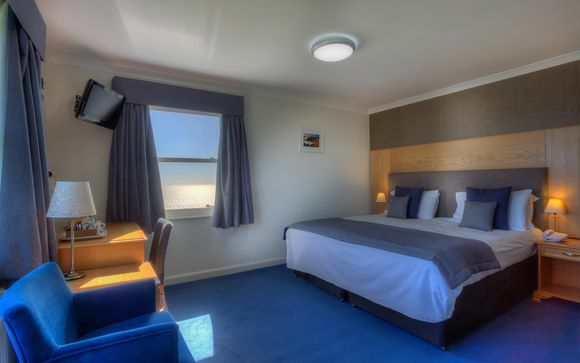 All rooms include a private en suite bathroom, television, hairdryer, tea and coffee making facilities, and Wi-Fi. The Classic Rooms are located on the second floor and are not accessible for wheelchair users. This offer is based on a Bed and Breakfast stay or a Half Board stay (Breakfast and evening meal served in the main restaurant - excludes drinks). Home to a bar, restaurant and coffee shop, Hotel Jerbourg offers a variety of dining options for guests to enjoy. With a special Sunday lunch menu and a dessert bar menu, whatever you're in the mood for, you'll be well catered to. With kayaking, climbing, diving, fishing, and surfing opportunities galore, the island of Guernsey is brimming with things to do. Close to the hotel, you will find a plethora of cycling and hiking routes. Visit the capital at St Peter Port and explore the town's renowned jewellery shops. Fans of The Guernsey Literary and Potato Peel Pie Society may like to know that the famous La Bouvee Farm is located just two minutes from the hotel. Other notable attractions include Victor Hugo's House, Bluebell's Wood, St Martin's Village, and the fascinating Castle Cornet. This offer is applicable for travel between 19/04-19/09. Guests will be collected after breakfast at the hotel foyer and given a presentation pack outlining the day ahead. You will then be taken to the harbour and jump on board the ferry for a short sea trip (55 minutes). Upon arrival at Sark, you will be greeted by the island tractor and taken up to the village where you will enjoy a sightseeing tour by pony and trap. The rest of the day is yours to spend at your leisure with opportunities for lunch at the village before returning to Guernsey. Car Hire: Car hire is included (car hire charges of £10.00 CDW and £2.00 local tax per day are the only compulsory charges and are payable to Europcar). Pick up/drop off at Guernsey airport. Distance from Guernsey Airport to Hotel Jerbourg: 6km / 12 mins. The named driver must also present a full valid driving licence on the collection of the vehicle and in some cases, a credit card or cash deposit will be required.